Less than 10 years ago, you probably couldn't imagine leaving the house without your cell phone, laptop or tablet. Today, a lapse like that usually calls for a U-turn back home. While we're not exactly in the future-telling business at Experts In Your Home, some forecasts are simpler to make than others, especially when it comes to our specialties, which include heating systems. So here's one we're confident that will come true: once you live with a programmable thermostat, you'll never want to be without one – just like your cell phone or computer. At Experts In Your Home, we're big proponents of programmable thermostats - and only partly because we know they can be real energy and money savers. You might have heard that U.S. Department of Energy research shows that homeowners who use the thermostats smartly – by turning down the thermostat between 7 and 10 degrees for eight hours a day during the winter – can reduce their utility bills by about 10 percent a year. But still, we know that change can be difficult – just as charging a phone every night and storing information on something lofty called a “cloud” once seemed to be. We've learned that once programmable thermostats are demystified and homeowners understand a few simple operating tips, they'll embrace this relatively new technology and never turn back. 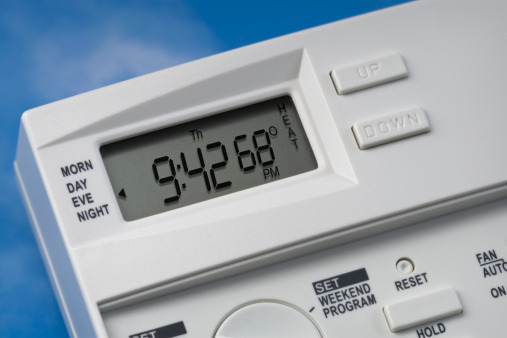 Programmable thermostats allow homeowners to set their thermostats hours, days and even weeks ahead of time – principally around the comings and goings of their family, as well as overnight. The whole idea is, why pay for energy when it's not necessary? And why be tethered to your thermostat, jumping up to change it when you're home? But don't get the idea that a programmable thermostat is akin to Big Brother; you can change the settings you've made at any time – ideal for those days when the actual weather deviates from the forecast. And if you have a smart phone, you can make a thermostat adjustment from a distance. Part of the fun of “breaking in” a programmable thermostat is making it work for you and your family – a straightforward project that the service technicians at Experts In Your Home are always happy to help with. Trying to keep the temperature set for at least eight hours straight. Fighting the impulse to use the override feature like you used a manual thermostat to manage your heating system. Using the “hold/permanent/vacation” setting for extended stays away from home and not on a daily basis. Considering a programmable thermostat for every level of your home to help you maximize the savings. We'll leave weather forecasts to the meteorologists, but we'll stick with our forecast about the value and benefits of programmable thermostats. Let Experts In Your Home make a believer out of you when you call us for a consultation – using your cell phone, of course. We are experts in your home. Contact us today! Are you properly maintaining your heating system? Download the free checklist below!